Cognex Corporation (NASDAQ: CGNX) has introduced a line of new position tools, colored lighting and filters, and a new sensor model, Checker® 4G7X, to expand the practical applications of its Checker 4G line of machine vision sensors. Checker now offers a new pattern-based position tool that supports 360-degree rotation to verify object location regardless of its position on the production line. Other new position tools integrated into Checker perform a variety of other important applications such as inspecting cap height and skew, label position, fill level, web position, and component placement. 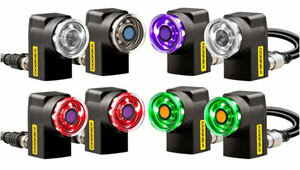 New colored lighting and filter options are integrated into the Checker vision sensor. These new features help optimize image contrast in the inspection process and bring out more of the features you want to inspect regardless of factory conditions, resulting in more consistent and reliable inspections. An example of visible colored illumination improving results is a user inspecting for the presence of a safety seal with red print over a white cap. Using green light would make the print appear black while using red lighting would remove the red print from the image. In both cases, colored light creates contrast where normal lighting cannot. The combination of built-in colored lighting and filters make this the most cost effective solution of its kind. Checker now offers integrated polarization windows that remove specular glare from images featuring highly polished or reflective surfaces. Eliminating glare helps create the best possible images and a more consistent inspection result. The newest model, the Checker 4G7X, delivers three critical functionalities built into a single device. With Checker 4G7X, production managers can simultaneously check for the presence, size and position of features on a single part. Additionally the Checker 4G7X seamlessly integrates into your factory network, communicates with PLCs, and features integrated color lighting and filters to form the most powerful Checker vision sensor to date. Checker machine vision sensors capable of working with this new portfolio of accessories are available now. For more information, visit www.cognex.com/Checker4G.